This post is about graduation party decor ideas. Summer is quickly approaching which means it’s grad party season! Whether you are the grad or the parent of the grad, it can be a challenge to think of grad party decor ideas to impress your guests. 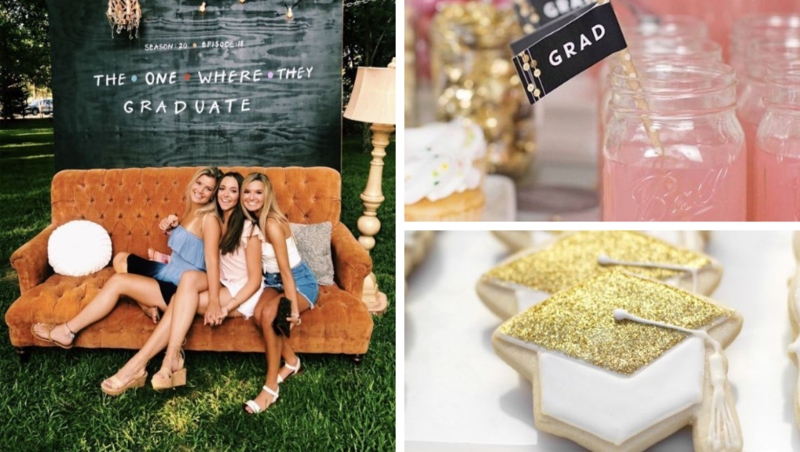 I know how stressful it can be to decide on a graduation party theme, but luckily this post will give you all the inspiration you need to throw an unforgettable graduation party! This post contains affiliate links, which means I make a commission, at no extra cost to you, if a purchase is made after clicking through a link. I value your trust and only recommend products that I truly love. Thank you for your support. How cute is this photo wall?! This is perfect to get lots of pictures with friends and family. You can even make sign with a custom hashtag like #christinasgradparty19 so that everyone can browse through all the photos later on Instagram. This idea is so cute! Have all your guests sign the globe and write a little message for the grad. This makes a unique decor piece to put in their dorm or apartment. The grad will have it forever and always be reminded of their friends and family! This globe is so cute and really affordable. It comes in a lot of colors to pick from. It’s 5 inches in diameter so will be perfect to put on their desk at school. I love this idea! People can snap pictures throughout the party and leave a special message on them. The grad can even take them to use as decor in their dorm! This idea of putting barista tables in the yard is so cute. It’s a great idea if you don’t plan on renting a tent or having a ton of guests. The flowers as a centerpiece with the grad’s picture make a really nice touch. I want to eat everything on that table lol! If you are having a dessert table, the big balloons that match the desserts are so cute! It definitely ties everything together and makes it look like a party dessert table. The balloons linked come in a pack of 6. This company also has a pack with 3 gold like the ones in the picture and 3 white. To get the look of the balloons in the inspo picture you can purchase white tulle to wrap around it and then tie it at the base of the balloon. Amazon has an inexpensive roll of white tulle that you can get to do this. They have many other colors to choose from so you could get your school colors instead of white! This is a really simple centerpiece to make! Just get some centerpiece sticks and put them in a mason jar. To make them stay upright I suggest putting sand in the mason jar or beads (see picture below). The centerpiece sticks I linked are selling out so fast. There are a few companies selling them and they all have less than 10 left in stock, except for the company I linked. I’ll be keeping my eye on this and updating you if they run out of stock or I come across any other cute ones! Don’t forget the mason jars! You can get a six pack of them here. I’m obsessed with this photo wall idea! If you are a huge Friends fan this is perfect for you! It’s definitely something that will take some time to put together and make, but so worth it! People will be talking about your party all summer long! This is so cute! Balloons are a must for graduation parties so adding some photos from your childhood or other meaningful pics make it even better! If you can, I would use string instead of ribbon because it will be easier to tape the picture to. Another tip would be to put 2 picture on each ballon. Put one in the front and one on the back with the string in between. This way people won’t see the string taped to the back of the picture. For my high school graduation party my mom made a board of lunch notes she saved through the years. I love this so much! It’s incredible she saved all these notes (and more) and thought to incorporate them as decor at the party. Love you mom!! I would link a foam poster board from Amazon, but it’s much easier to just run to your local dollar store and grab one for a dollar. A board of keys to success notes makes for a really cute decor piece and helpful for the grad. Guests can share a piece of advice for the graduate. I had this at my grad party and I still have the notes from everyone. This photo wall will make people think they are walking into Anthropologie when they arrive at your party. It’s so cute and easy to set up! In the inspo pic they draped a large off-white sheet over a photography backdrop stand and then added a ton of tassel strands. Making the initial of the graduate as a centerpiece is a great way to personalize the party. This centerpiece is really easy to make and looks so cool. All you have to do is get a black cardboard letter and add some ribbon down the side with a degree cutout. This cupcake stand has a graduation cap on top! This is a perfect thing to add to the dessert table. This is a really cute idea. Guests can share advice they have for the grad or write them a special note. They’ll always have the notebook of letters from their friends and family. It would be a nice reminder for them to have with them through college or after! If you want to use your school’s colors as the theme this is a really great way of incorporating them. Order a bunch of your school colors balloons and letters of your school. This is a great area to take photos at. A really cute and affordable way to transform your house for the party is to put up a ton of baby pictures up. I’m sure any parents planning the party will love this. They get to embarrass their kid one more time before the go off to college or move away to start their job. Put out a mason jar with piece of paper for friends and family to write their favorite memory on. The grad can look through all the memories after the party. This is a great way for people to share their best times they’ve had with the graduate. What a cute cake topper for grads who are super extra lol! They cake will shine just like them! Also, how delicious does that cake look?! Whoever thought of putting macaroons on cake is a genius. How cute are these cookies?! You can either make them at home or order them from a bakery. They will make your dessert table that much cuter! These cute straws are so affordable and make drinks stand out. Everyone will be taking pictures with their cute drinks in hand. Christina Bernhardt is the founder of It's Christina Bee, a blog for young adults to learn new things and take on everyday life. When she's not writing for the blog you can find her spending time with friends and family, painting, or attending college classes. She enjoys a good cup of coffee and sunshine. Fun and memorable ideas–Love it all! Your creativity is endless. And I love you too sweetie. Remember the masks we did in school colors for picture opportunities too!